Atlanta leaders packaged within an exciting treasure hunt. 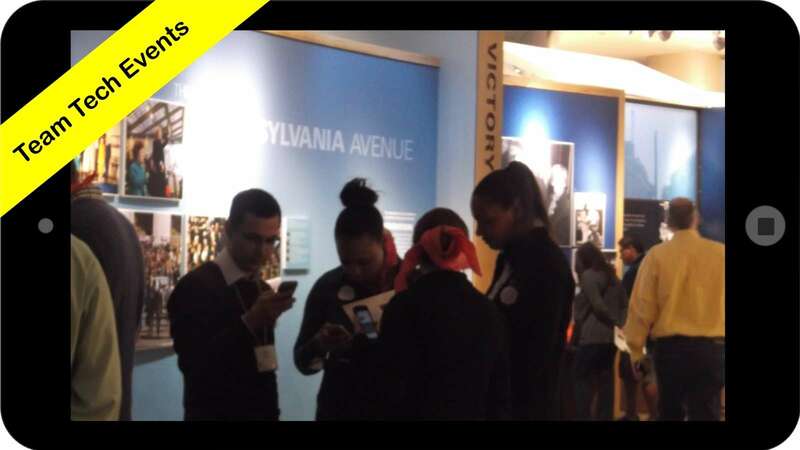 Played at either the Carter Presidential Museum or the Martin Luther King Center, teams work their way through a cultural site scavenger hunt packed with leadership games. Teams learn about key leadership skills, track historical examples of great leadership, and interact with that information in fun and creative ways. Around the museum, teams reveal leadership learning modules, followed by short quizzes and interactive challenges that helps turn ideas into practiced skills, along with fun photo and trivia challenges. The combination of competitive hunt and leadership games makes learning much more fun than a standard workshop. Welcome & Warm-Ups (5-10 minutes) Our staff welcome the participants to the museum and get everyone ready for a great treasure hunt experience. We then lead some fun warm-up activities that also randomly create small teams. Hunt Tasks & Leadership Modules (1-2 hours) Teams use the app to explore the museum and unlock leadership challenges. Each challenge includes a module, questions about the content, and leadership games & activities to help participants internalize and practice what they just learned, along with a lot of fun bonus projects. GAMES This assortment of fun challenges keeps the group energized and entertained so they stay on task. Portrait Missions: Teams do their best to take selfies with exhibits that look like their teammates, reenact famous scenes, or pose with famous objects. Curator Challenges: When a team finds a facilitator in the museum, they can accept more involved projects such as historical figure interviews, great day in history reenactments, alternate history headlines, and more. Brainteasers: These mental challenges help teams stretch the cognitive muscles used by great leaders. CONTENT MODULES We help you identify which of our learning module topics are best for your group. Teamwork Compass® Our 4-quadrant model of what is needed for an effective team, and how everyone has strengths valuable to the team. Leadership Styles Matrix This powerful insight gives developing leaders a clearer understanding of their how their styles impact the people they lead. Motivation Learn effective strategies for motivating people and helping develop long term commitment. Group Problem Solving This module gives leaders a system for helping their team find constructive solutions. Team Coaching A simple but powerful coaching tool to help everyone on the team perform at their best. Post-Event Feedback: After the event, you will receive a report showing the group’s answers to the quiz questions, responses to open-ended questions, and their recorded interactive activities to help you evaluate leadership skills. "On behalf of the entire management team, thank you for providing us with an informative but fun day."